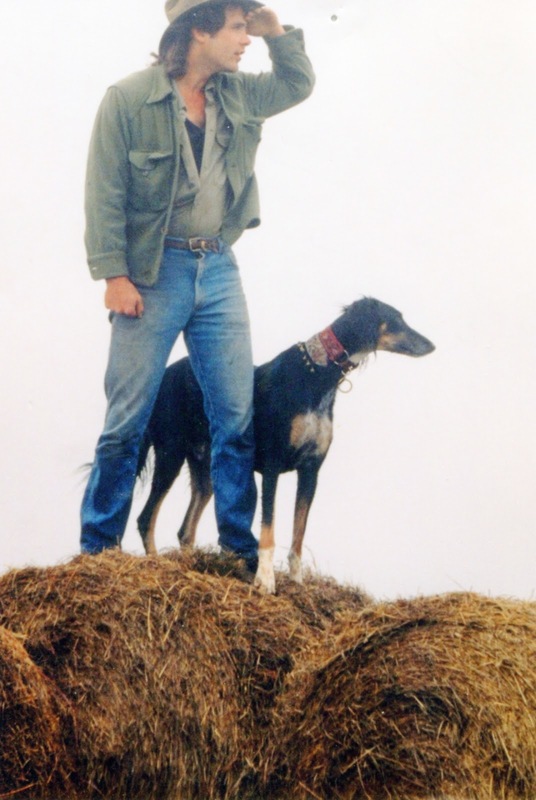 Our blog friend and frequent commenter Lane Batot lives an enviable life in the wooded hills of North Carolina, working at the zoo, rambling the wild lands with his team of dogs and his spear, reading and collecting a natural history library that would rival mine. At the moment he has thousands of books, thirteen dogs including a pair of tazi boys from Vladimir Beregovoy that are cousins of ours, and four ferrets; if I have gotten any numbers wrong I am sure he will let me know. 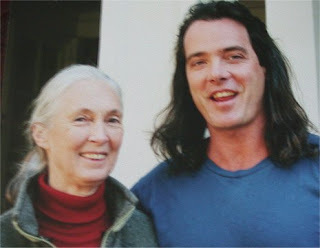 But Lane is not only Ortega's "Municipal Paleolithic Man"; he is an amateur scholar of Edgar Rice Burroughs, a former Sasquatch, and a long time friend of Jane Goodall's who has worked at Gombe. They meet occasionally when Jane speaks at a nearby venue, but this year Jane and the Edgar Rice Burroughs Society conspired to fly him to LA for the big Tarzan festivities. I wish I still had the typing skills and energy to re- type his entire 20- some page handwritten letter about his wandering around in an alien habitat, but I think that his official interview will do. I'm gettin' ready to be GAWN frum work for 5(count 'em!) days, so near NO computers, so I better(sorry Steve) make some "corrections" now.... Many more modern folks do NOT consider my lifestyle "enviable", but think of me as more of a wretched, backward peasant... I have no idea how many books I have)never counted them, actually--probably CAN'T count that high, actually), but thousands sounds about right. The bookshelves groan constantly, and the floor is bowed down wherever there are bookshelves in the cabin... I limit myself to ONLY 10 dogs at any given time, and I am only TWO over that self-imposed limit now, not three. Alas, I lost my beloved Salmon hound "Hawkeye" last summer at 10 years old(sigh), which is why you probably still thought lucky 13...I don't know anyone named "Ortega", but I have bought his taco shells before...I also have no idea what "municipal" means--sounds too organized and oppressive to me...that ERBzine interview was done by numerous E-mails over several days of questions, which accounts for it's kinda redundant,repetitive rambling. Except sometimes I do ramble redundantly and repetitively...Jim Cornelius, if you're out there, pay pertikuler attenshun to the LAST photograph of that link/interview--photographic evidence I REALLY WAS a "Frontier Partisan"! Ha! You might wanta use that one for YOUR blog!....The dog photos posted didn't explain enough--the second photo was of my Weimaraner Griswold, the Tazi boy Yantar, and Brick, who I have determined is a former Yugoslavian Weasel Hound crossed with a Venezuelan Brown Capuchin Monkey Hound--they were after a flying squirrel, of all things, they'd just flushed out of a nearby hollow tree. The squirrel got away, luckily....and man, I GOT to send you more current photos of myself if you are going to publically post them. I look somewhat differently these days--my hair, for one, is somewhat more "varieagated".... Otherwise, all that other stuff is correct...And brace yourself Steve(and Libby!) for the 70+ page Sasquatch confessions......L.B. It's great having Lane around — here and at frontierpartisans.com. A true characte5r in the best sense.